Psalm 92 is titled, “A Psalm. A Song for the Sabbath.” The Sabbath was a central institution in the Old Testament. God had strictly charged Israel to keep the Sabbath day holy. God declared that he had grounded the sanctity of the Sabbath in his creation, (Genesis 2:3; Exodus 20:8-11), and in his redemptive work, (Deuteronomy 5:12-15). When the prophets warned Israel about her sins, desecration of the Sabbath was listed as a very serious issue, (see, for example, Isaiah 56; 58). Because of the importance of the Sabbath for Israel, it is surprising that this psalm is the only one in the Psalter that refers to that holy day. Even more surprising, perhaps, is the apparent absence of any clear reference to the Sabbath in the body of the psalm. We find the key to the meaning of this psalm in its central verse: “You, O Lord, are on high forever,” (v. 8). This psalm exalts the Lord who is high and lifted up, (Isaiah 6:1). The praise of his people does indeed exalt and glorify the Lord. Even though our praise cannot actually make God greater or higher than he is, the Lord is pleased for our praise to exalt him in our minds and hearts. How does this psalm exalt the Lord for us? First, and remarkably, this psalm teaches us that God is exalted in the destruction of the wicked. In our sentimental age, we have become squeamish about the terrible judgment that awaits those who reject the Lord, but the Bible is clear from beginning to end that such a judgment is coming. That judgment will be just and will vindicate the holiness of God. The wicked may seem to flourish for a time and be exalted in this world, but in the end they will perish everlastingly. When we praise God on the Sabbath for the coming judgment, we remember the importance of rejecting worldliness to pursue true Godliness: “The stupid man cannot know; the fool cannot understand this: that though the wicked sprout like grass and all evildoers flourish, they are doomed to destruction forever. 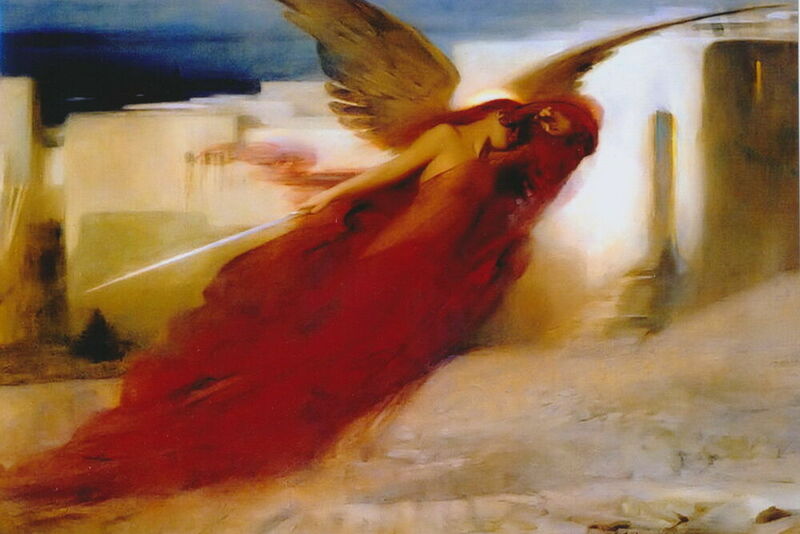 For behold, your enemies, O Lord, for behold your enemies shall perish; all evildoers shall be scattered,” (vv. 6-7, 9). Second, the Lord is exalted in the flourishing of the righteous. The psalm compares the righteous to healthy trees: “The righteous flourish like the palm tree and grow like a cedar in Lebanon. They are planted in the house of the Lord; they flourish in the courts of our God,” (vv. 12-13). The righteous are not fleeting grass, but long-lasting trees. They have the beauty of the palm and the strength of the cedar. They are also near to God, growing in the very courts of the temple. God promises that they will stay vital and productive even into old age: “They still bear fruit in old age; they are ever full of sap and green,” (v. 14). The image of the people of God as a tree is particularly appropriate for the Sabbath day. The tree does not flourish because of its cleverness or hard work or free will. It flourishes because of the work of the gardener who plants it, waters it, nurtures it, and protects it. Surely, God is exalted in the blessings he gives to his people. Third, the Lord is exalted in the revelation of God’s character. 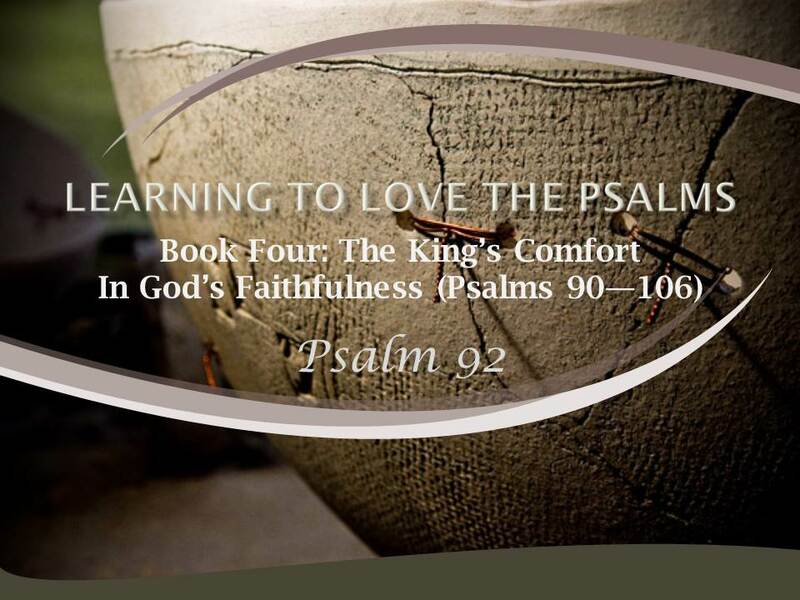 The psalm exalts the Lord by proclaiming, “Your steadfast love in the morning, and your faithfulness by night,” (v. 2). God has loved his own from eternity and will ever continue to love and care for them. Because he loves them, he is always faithful to his promises. He is completely reliable and worthy of all praise. He is also perfectly holy in all his doings: the righteous will proclaim, “The Lord is upright; he is my rock, and there is no unrighteousness in him,” (v. 15). God’s character is a great comfort for his people in all circumstances and trials of life. Finally, God is exalted in the song of the Sabbath itself. As God is enthroned on the praises of Israel, (Psalm 22:3), so he is exalted by the singing of his people. “It is good to give thanks to the Lord, to sing praises to your name, O Most High; at the works of your hands I sing for joy,” (vv. 1, 4b). Here is a song that God inspired to be used in worshipping him on the Sabbath. We must remember that God made the Sabbath for worship as well as rest: “The Lord spoke to Moses, saying, ‘Speak to the people of Israel and say to them, “These are the appointed feasts of the Lord that you shall proclaim as holy convocations; they are my appointed feasts. Six days shall work be done, but on the seventh day is a Sabbath of solemn rest, a holy convocation,”’” (Leviticus 23:1-3a). Psalm 92 seems to be set in the mouth of Israel’s king: “You have exalted my horn like that of the wild ox; you have poured over me fresh oil. My eyes have seen the downfall of my enemies; my ears have heard the doom of my evil assailants,” (vv. 10-11). While the reference to anointing oil could point to a priest, the combination of oil with the horn of strength and the defeat of enemies surely means the king is speaking. This point is even more clear when we compare these verses with the words about David that we read in Psalm 89: “For you are the glory of their strength; by your favor our horn is exalted. I have found David, my servant; with my holy oil I have anointed him. I will crush his foes before him and strike down those who hate him. My faithfulness and my steadfast love shall be with him, and in my name shall his horn be exalted,” (Psalm 89:17, 20, 23-24). At this point, we see that the Sabbath psalm not only answers the crisis of faith of Psalm 89 by reminding us of God’s faithfulness in creation and in the covenant given at Sinai, it also reminds us that it is the king who leads Israel’s praise on the Sabbath day. God will not abandon his king any more than he will abandon his creation, his covenant, or his people. So who is this king? Once again, the only answer to that question is Jesus. He is the son of David and the true King of Israel. On his lips alone is perfect praise offered to God. He is the Lord of the Sabbath, (Mark 2:28). Many Christians have come to believe that Jesus as the Lord of the Sabbath abolished the Sabbath because it was the purely Mosaic institution. We have already seen that the Old Testament saw the Sabbath as a command of creation that was reiterated, not instituted, by Moses. Even in the words of Jesus himself we see this: the Sabbath was made not for the Jews, but for “man,” that is, for all mankind, (Mark 2:27). As the Sabbath was a moral command of God from the beginning, so it remains a moral command of God. The New Testament passages that are often cited as teaching that all days are alike in the new covenant actually do not reject the Sabbath, but only the elaborate Jewish calendar of holy days. Revelation 1:10 makes clear that in fact there is a holy day in the new covenant: “I was in the Spirit on the Lord’s day.” The Lord’s Day is a special day belonging to the Lord. In the New Testament, the only day given any special attention is Sunday, the first day of the week, the day of the resurrection of the Lord Jesus. Jesus as Lord of the Sabbath has made the first day rather than the seventh day a holy day for his own. From the beginning of creation to Jesus, we looked forward to the rest that would come in the end. With the coming of Jesus, rest has been won in his resurrection, and so, we as Christians begin our week with rest in Christ and worship of Christ. The Sabbath psalm does not celebrate the Sabbath itself. It knows that from the beginning the Sabbath was not an end in itself but a means to an end. As Jesus said, “The Sabbath was made for man, not man for the Sabbath,” (Mark 2:27). The Sabbath was made for a day of rest so that man could worship and fellowship with his God. It was not a burden, but a blessing. On the Sabbath, man grows in grace and praises his God. The Sabbath was and is a weekly reminder that we serve a reliable God who will destroy his enemies and will prosper his people even if they have to wait a long time to see it happen. Psalm 92 is a perfect Sabbath psalm because it helps us to worship and praise our God. Why is this psalm titled, “A Song for the Sabbath”? In what four ways does this psalm exalt the Lord for us? Why does Psalm 92 seem to be set in the mouth of Israel’s king? Why is it that many Christians have come to believe that Jesus – Lord of the Sabbath – has abolished the Sabbath because it was a purely Mosaic ordinance? Has your view of the Sabbath changed over time? If so, how?